Posted by admin on July 17, 2010; This entry is filed under Design Role Analysis, France, Leading, Nord-Pas-de-Calais, Periurban Area, Pévèle, Pévèle > Periurban area > Nord-Pas-de-Calais > France. The genesis of the project is a progressive interplay between the Regional Council of Nord-Pas-de-Calais represented by the Direction of Sustainable Development, Foresight and Assessment (D2PE) and La 27e Région in collaboration with Strategic Design Scenarios. There is no specific leadership in that case but more a mutual stimulation process. Until now La 27e Région and especially its main activity of organising the Territoires en Résidences’ programme is based on co-funding (by the ARF Association of French Regions, the Europact European Programme the Caisse des Dépos public venture capital and the FING think tank). This ensures a partnership posture with each of the regions hosting a residence with possibility to negotiate orientation and keep a freedom space compared to a subcontractor position. 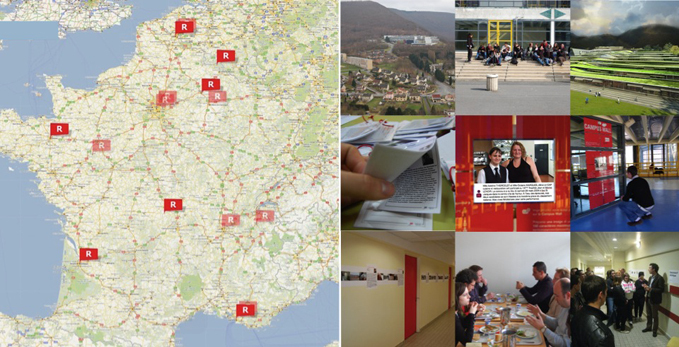 La 27e Région’s activities largely relates on design-based approaches but not only. It is defining as a public innovation lab relating on multi-disciplinary design-driven methodology. Which is to say that the core methodological process and tools are coming from the service design, participative and user-centres design. But other and different approaches with a potential to renew public action are considered such as social entrepreneurs; collective of architects; project-oriented sociology; alternative planning; public art and happening… The result is a different multidisciplinary collaboration according to each different teams of residents but where leadership to ensure project development and delivery relay on a design approach. The residences and the enthusiasm this innovative approach in public sector is triggering constitute the main ‘trust engine’ for public authorities to support this initiative and engage with larger projects. Today still, actions in the public area tend to be compartmentalised preventing cross-fertilization between sectors and paradigmatic changes. The methods inherited from management, auditing, consulting and techno-economic innovation tends to demonstrate their inefficiency in front of the increasing complexity and interdependence of environmental, social, economic, cultural and technological issues. Residences appear then as light, hand-on, collaborative action-research approach oriented to quick experimentation, capacity building and progressive dissemination of the innovation process.